Commitment to community through integrated, intelligent practices, grounded and authentic spiritual study, therapeutic principles and in general, a deeper way to go about living life. 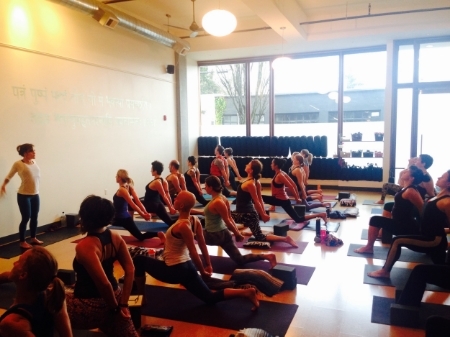 Yoga, biomechanics, alignment, chanting, meditation, spiritual study, and more for your health in Southeast Portland. The Bhaktishop Yoga Center is deeply curated labor of love, bringing this great tradition of yoga as an agent of social change alive through integrated, intelligent practices, grounded and authentic spiritual study, therapeutic principles and a deeper and more inter-connected way to go about living life. We have been committed to this community through social activism for twelve years, and care deeply about creating a sanctuary for all people to feel safe and welcome. In keeping with this commitment, we routinely engage in self- and community education around issues inclusion, accessibility and justice. This practice comes in so many forms, cultures and paths that it can be challenging at times to navigate. 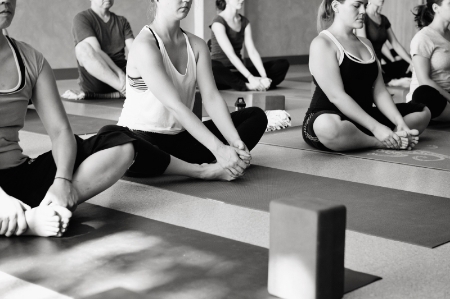 We believe that there is an ideal yoga practice for every single body and every unique intention, and we aspire to help you find an effective path to health, service, inspiration, and fulfillment. We absolutely believe that there are ways of participating in a yoga practice that doesn’t entirely comply with commercialization and capitalism. For example, we know you can practice yoga without a mat or fancy pants, without oppressive diets, MLM’s or fake “health” peddling, and without ridiculously loud music or impossible postures or high-speed class culture. As students ourselves, we can work toward creating an intentional environment where we create relationships with folks who are interested in both the healing benefits of the practices as well as the community-building and decolonizing revolutionary parts. We are first and foremost students of yoga ourselves. Yoga is an intrinsically individual discipline that requires a great variety of techniques to satisfy the great variety of individuals. We do not teach one particular style of practice here but instead strive to share the essence of yoga: the skillful combination of physical movement, conscious breathing, deep devotion, and concentration/meditation with the intention of bringing you closer to authentic knowledge of yourself. All of our teachers are unique and experienced in multiple fields of study, and we wholeheartedly embrace our many varying lineages and perspectives. Our united approach of embracing the varying perspectives of you, the student, helps provide conditions within each class for individual experience and meaning. We aim to honor and revere both you and yoga in all of its diversity, with an attitude of service and a willingness to allow ourselves to be taught every day by each one of you. We also believe that yoga should be accessible to all people, regardless of race, ethnicity, cultural or religious orientation, immigrant status, gender identification, sexual orientation, income, size, age or ability; we work diligently to create a safe and accessible space for everyone. All of us are well-trained in strong bio-mechanical principles with a loving eye toward injury prevention and individualized attention. We offer you intelligent, detailed instruction in asana, pranayama, meditation, chanting, Ayurveda, Restorative practices, Therapeutics with qualified instructors, Prenatal and Post-partum care, and many specialized workshops, including training teachers to be even better teachers. 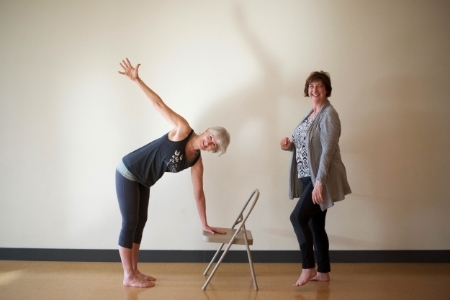 Our commitment is to furthering the conversation about yoga in our studio, your house, your community and beyond. In July 2016, Oprah Magazine interviewed Lisa Mae for a story about morning rituals in relation to yoga. Much of the interview was cut out, but here is what made it into the Summer 2016 Issue of Oprah! March 15th 2013 - Take a listen to this sweet interview on KBOO about kirtan featuring the music of Mala, and The Bhaktishop's kirtan choir! Feb 14th 2012 - Portland Mercury - "It's by far my favorite studio in town, with a perfect blend of no-nonsense yoga practice..."
May 2009 - Stephen Malkmus gives us a glowing shout-out in the Portland Monthly! January 2008 - The Bhaktishop gets a big "Glowing Review" in the Mercury.